When I first visited Perth, the capital of Western Australia more than 10 years ago, I saw a large city with a small city feel. It was very quiet after dark and didn't really have a lot of modern architecture, except for one, more later. Still being the fourth largest city in Australia after Sydney, Melbourne and Brisbane, Perth has seen a huge change over the last 10 years. With an expected growth rate of almost 200%, it is forecasted to overtake Brisbane in 10 years from now. The start of the "new Perth" was the Swan Bells building, also often referred to as "The Bell Tower". Being one of the worlds largest musical instruments, it houses 18 working bells, of which 12 are very historic 18th century bells; donated by the British government at the end of the previous century. They used to hang in the St Martin-in-the-fields church in Trafalgar Square, London. Given that boat building used to be a major activity at the Barrack street location, it is no surprise that the architects (Hames Sharley) gave the Bell tower a noticeable nautical theme. Its copper sails reflect Western Australias link with the water and mining industry. Swan Bells was named after the nearby Swan river, and saw completion a few weeks before the new millennium was born. I find it interesting how some people initially were against the tower as it obviously wasn't cheap. 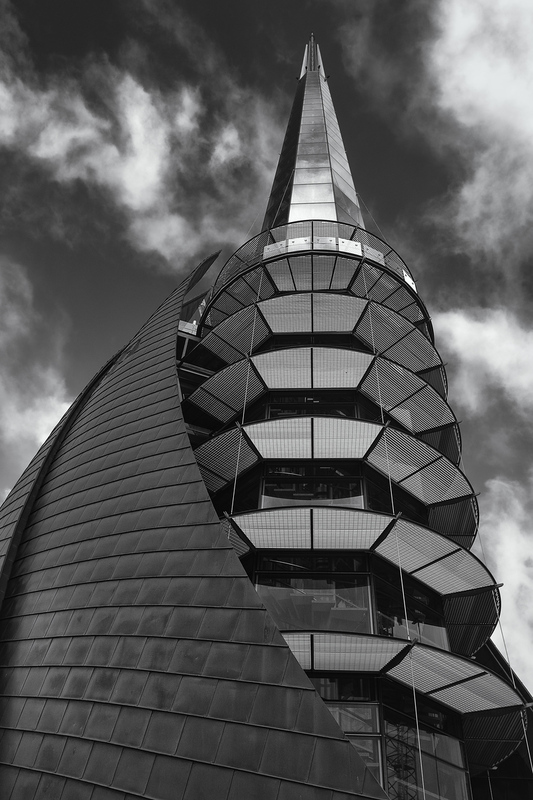 Modern architecture does however often give a great boost to a city; Perth being a prime example of this! I find it really a shame that Google is discontinuing the Nik Software collection; to me it is still one of most powerful plug-ins for Black and White conversions... I guess, I'll need to look for an alternative soon. If anybody has a specific recommendation, I would like to hear from you! Time permitting, I will try to blog about some of the other interesting project in Perth in the near future. Meanwhile, more Architectural images shot in the capital of Western Australia can be found here. Remember: "All architects want to live beyond their deaths" - Philip Johnson. The Port of Zeebrugge, just outside the famous city of Bruges in the west part of Belgium, is the worlds largest "Roll on - Roll off" cargo (RORO in short) port in the world. RORO cargo is basically everything that rolls; cars, busses, tractors, trucks, bulldozers, etc... In 2016 alone, 2.8 million new vehicles came through Zeebrugge port! All in all a great setting for some new aerial photography, using my little yellow plane; a 1954 Piper Super Cub! 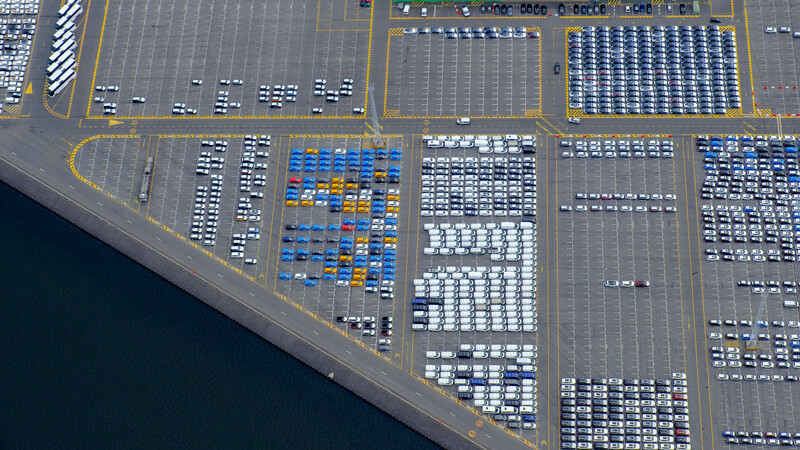 The image below of part of the harbor, shows a few hundred cars waiting for their next transport; be it a RORO ship or a truck transport car over land. While Aerial photography is all about interesting patterns for me with the image below being a great example of this! I especially like the triangle of the water on the left hand side, showing a sense of place. Make sure to click on the image below (preferably on a large computer screen), in order to see the amount of detail the image holds! More images of my aerial trip to the Port of Zeebrugge can be found here. 100 Years ago, the three day Battle of Langemarck started, part of the larger Battle of Passchendaele (also known as the Third Battle of Ypres), which is often criticized for being one of the most horrific and senseless battles of WW I; killing more than half a million people, on both sides of the front, over a three month period. All of this, for just a few kilometers of shift in the Western front and eventually the recapture of the small village of Passchendaele (Passendale in Flemish). The last few years the Flanders Field region has been marked with several large remembrances with one the largest ones being held just a few weeks ago. Part of it was held at the Memorial Museum Passchendaele, where a few hundred re-enactors were role playing some of the events of 1917. 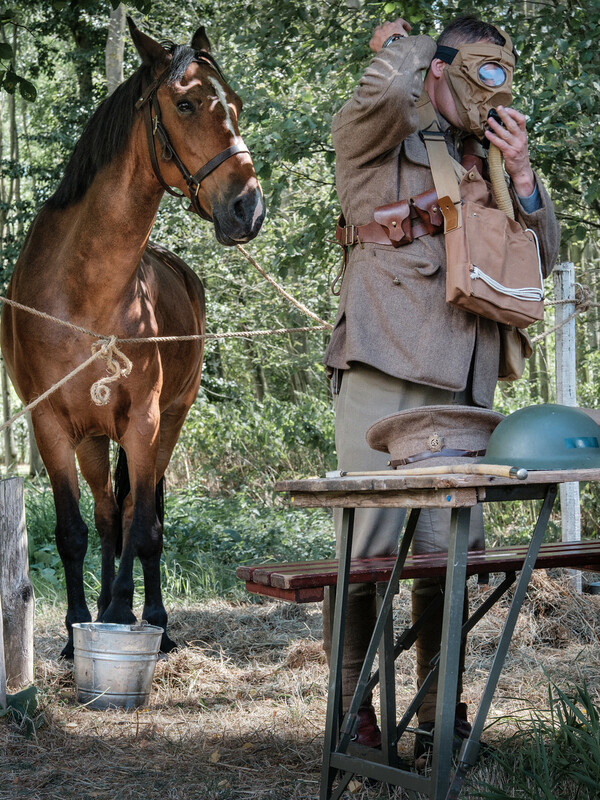 The image below of a British soldier donning a gas mask next to his horse, is such a very telling scene. Especially since horses played such a large role in WW I as the primitive vehicles available at the time, often couldn't cope with the rough and muddy terrain. Even more so during the Battle of Passchendaele (sometimes called the Battle of Mud) as 100 years ago, the region saw some of the heaviest rainfall in more than 30 years. Ironically the last few weeks in Belgium have been very wet as well! A dedicated gallery of mine to the region, called Flanders Fields, can be found here. I would like to conclude with a very telling video below. Over the last few months, my Architectural photography has been somewhat put on the back burner. Having said so, I still really do enjoy documenting great Architecture; whether it is an early 20th century or Modern building, it often gets my attention! For me the Art Deco period and more specifically the Late Art Deco between both World Wars, is really something special. Knowing the 1930's are being referred to as the Great Depression years, some of the Architecture that came out of this period remains very unique. Such is the case of the Villa Cavrois in Roubaix, close to the Lille in the North part of France. It was designed in 1929 by the famous Modernist Architect Robert Mallet-Stevens for Paul Cavrois, an industrialist active in the textile industry. When the huge villa was finished in 1932 it was very advanced for its time, having central heating, cold and hot softened drinking water, electric clocks, inter-phone system between the rooms, telephone with the outside world, electric vacuum cleaners and even towel heaters! During World War II, the German military confiscated the house, but the family Cavrois returned to it in 1947. After that it remained inhabited till the death of Madame Cavrois in 1986, but then rapidly decayed when it was looted and occupied by squatters. It quickly became heavily vandalized and some people wanted to demolish the villa in order to sell of the land. Luckily the French government eventually stepped in when the Ministry of Culture bought it in 2001. 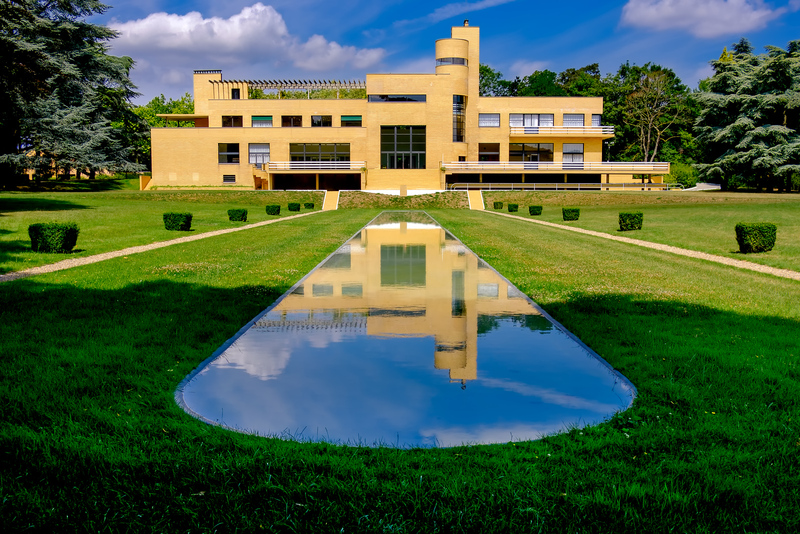 After an extensive 15 year restoration period, having invested 23 million euro, the Villa Cavrois was in 2015 finally restored to its full glory and is now one of the 85 cultural monuments in France. If interested in visiting the place (which is great for Architectural photography), visit their website here. The full collection of the images shot during my 2 hour visit at Villa Cavrois can be found here. Although I haven't added an Architectural portfolio image in a while, I believe the one above classifies. A 50mm lens is commonly used for street photography on a full frame or film camera body, but on a cropped sensor body like the X-T2(0), it becomes a 75mm equivalent; a focal length which is just at the lower edge of being a portrait lens and sometimes being referred to, as too long for street work. While it is definitively a complete different style of shooting compared to using the XF23mm f2, surprisingly it has found a place in my street photography for now! I look at it as my "across the street" type of lens for street photography; when shooting a scene from a distance with the 35mm f2, I often find being just a little bit too far; the 50mm f2 sorts this problem entirely. It's also a great lens for those photographers new to Street Photography that might still be a little shy or apprehensive shooting from a short distance. Secondary, I often also use the lens for Street Portraits and thirdly for detail shots like at local markets, etc... I've forced myself to only use the 23mm f2 and 50mm f2 for all of my Street Photography over the summer months. Expect a second look at the lens somewhere early september. Now back to the Pic(k) of the week; the image below was shot in Bangkok (Thailand), quickly becoming my favorite place to shoot Street Photography in Asia but with Hong Kong and Singapore being not that far behind! As I was walking across the street I bumped into this friendly/funny security guard. 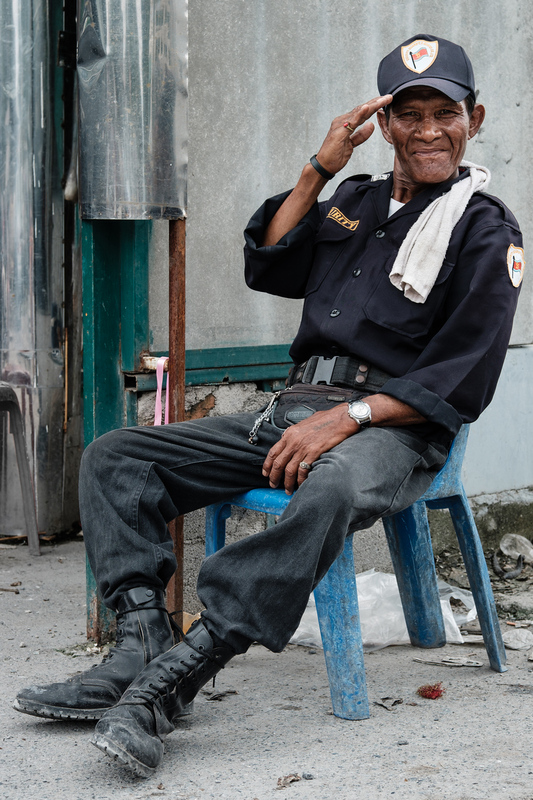 Personally I think of Bangkok as really being a city to shoot colour work, more of this can be found here.